July 31, 2015 / FOIMan / Comments Off on FOIMan Revamped! FOIMan’s got a new front door. Regular visitors to the FOIMan site will have noticed the gradual shift over the last couple of years as it has changed from being the output of a hobby to something which is better geared to marketing my services. This has been inevitable given my own professional development over the same period. Hopefully though it hasn’t adversely affected your enjoyment of the site, and it’s important to remember that all of that marketing and commercial nonsense helps to make it possible for me to keep the blog and other free resources going. (I tell myself that I keep up these things to bring more people to the site, but let’s be honest – it’s still mostly because I enjoy doing them). 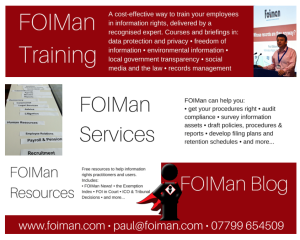 The latest development is that any visitor to foiman.com will now see a web page highlighting my training and other services as well as all the free resources you know and love (the site colour pallette’s changed a bit too, but that’s a minor change). It will hopefully make it easier for visitors to find what they’re looking for. But don’t worry, the blog is still here – it has it’s own link in the menu, a link from the home page, and new posts will still be highlighted on a range of social media. And if you can’t stand the marketing guff, you can still access the blog directly at www.foiman.com/foiman-blog. I hope you like the revamp, and do let me know if you have any comments on the changes or other suggestions as to things you’d like to see here at foiman.com.